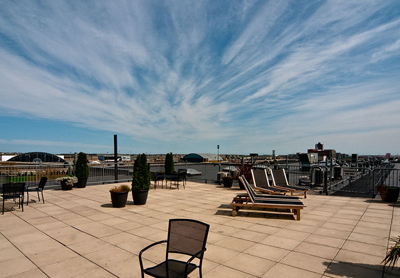 There is an incredible common roof-deck with stunning views of the city. 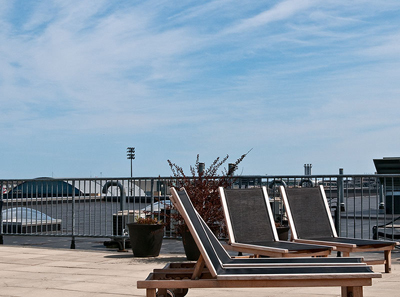 It offers the best view of Boston and plenty of space for privacy and relaxation. 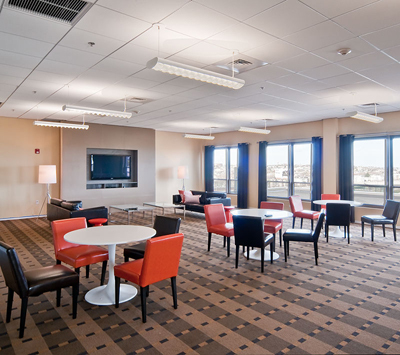 Also on the penthouse level of the building there is a stunning entertainment room with a full kitchen, which can be used by the residents of the building for meetings, functions, gatherings or just to relax at any time. It also features a flat screen TV and free wiifi for your convenience and enjoyment. It was completely renovated and designed by award winning interior designer, Andrew Terrat of Terrat Elms Design and is an amazing feature to have on the roof top for all of the residents. Management is on site, which is perfect for ensuring that the building is kept immaculate and well cared for at all times. The exceptional staff makes sure that the building operates smoothly and can assist you when repairs are needed. Someone is also available 24 hours a day for any emergency that arises and even can assist you if you lock yourself out. The management company does such a fabulous job in caring for the building that although the building has been occupied now for nearly six years, it looks as fresh as the day it was completed. 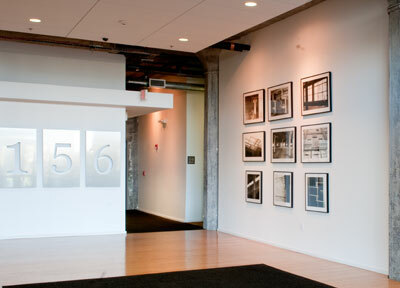 In 2010, the building qualified for FHA financing, allowing buyers to purchase a loft with as little as 3.5% down. A security system at all entrances gives you peace of mind and the intercom system connected to your telephone allows you to always know when your guests or packages arrive. If you are not at home, the on-site property manager can sign for your packages and notify you that they are waiting for you and are secure. This is a terrific concierge type service without the high price of a concierge. A security system at all entrances gives you peace of mind and the intercom system connected to your telephone allows you to always know when your guests or packages arrive. If you are not at home, the on-site property manager can sign for your packages and notify you that they are waiting for you and are secure. This is a terrific concierge type service without the high price of a concierge. The building is pet friendlyand with a brand new 40 acre multi-million dollar park directly behind the building, your dogs will never be happier. It also provides beautiful views for the units facing this incredible green space. The Harbor Walk is close by offering another place for your pets to stroll while you take in the soothing views of the harbor. • Private Locked Storage Rooms Available for $18,000.